What are the literacy levels of adults, and how does the United States compare to other countries? The Program for the International Assessment of Adult Competencies (PIAAC) is a cyclical, large-scale study that was developed under the auspices of the Organization for Economic Cooperation and Development (OECD). Adults were surveyed in 24 participating countries in 2012 and 9 additional countries in 2014. PIAAC broadly defines literacy as "understanding, evaluating, using, and engaging with written text to participate in society, to achieve one's goals, and to develop one's knowledge and potential." PIAAC results are reported as scale scores on a 0–500 scale. PIAAC reports five proficiency levels for literacy: Below level 1, Level 1, Level 2, Level 3, and Level 4/5. Compared with the PIAAC international average distribution of literacy skills, the United States had a larger percentage of adults performing at both the top and bottom of the distribution. Thirteen percent of U.S. adults age 16-65 performed at the highest proficiency level (4/5) on the PIAAC literacy scale, which was higher than the international average of 12 percent. Eighteen percent of U.S. adults performed at the lowest level of the PIAAC literacy scale (at or below Level 1), which was higher than the international average of 16 percent. Average scores on the PIAAC literacy scale for adults age 16 to 65 ranged from 250 in Italy to 296 in Japan. 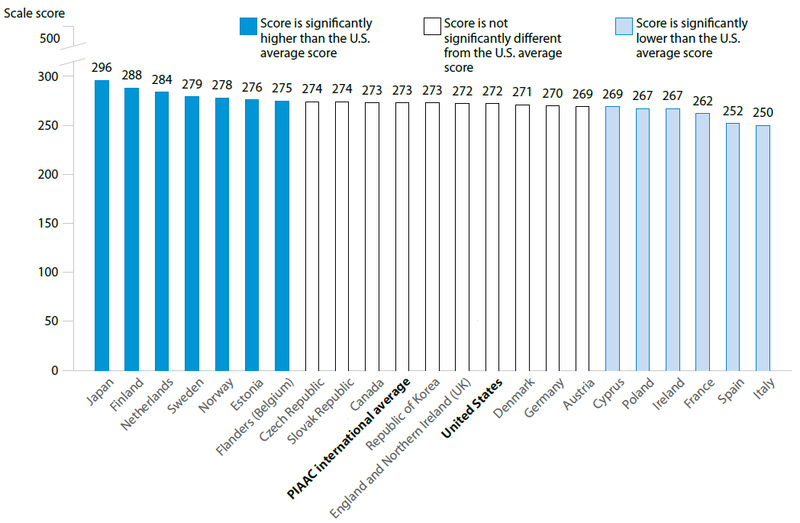 The U.S. average score was 272, which was not significantly different from the PIAAC international average score. Compared with the U.S. average score, average scores in 7 countries were higher, in 6 countries they were lower, and in 8 countries they were not significantly different. On the literacy scale, the average score for adults age 16 to 65 in the United States on the PIAAC (2012/14) was significantly higher than the score on Adult Literacy and Lifeskills Survey (2003–08) but was not significantly different than the score on International Adult Literacy Survey (1994–98). SOURCE: U.S. Department of Education, National Center for Education Statistics. (2016). Program for the International Assessment of Adult Competencies (PIAAC) 2012/2014 Results. 2018, Adult Literacy and Lifeskills Survey (ALL): This site provides publications and data from ALL, an international comparative study designed to measure the literacy and numeracy skills of participating countries adult populations. 2018, National Assessment of Adult Literacy (NAAL): This site provides publications and data from NAAL, a nationally representative assessment of English literacy among American adults age 16 and older.